Birds, birds, its always birds! That's 'cause I love 'em and they always steal the show on a card. 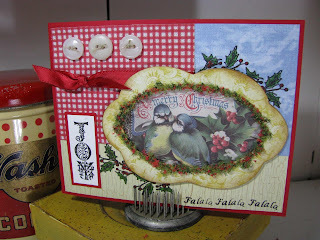 These 2 little Merry Christmas love birds are from Crafty's Christmas Image & Journal Notes booklet. I framed them with some leftover chipboard frames that came with one of Crafty's rectangle chipboard albums that I used as wall hangings! I cut out yellow patterned paper and mod-podged the paper onto the chipboard, then used my vintage christmas flowersoft to outline the image. I stamped more holly around the image edges and colored them in with Copics. 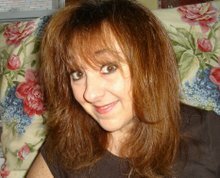 I have a bingo card to show you tomorrow, I just need to photograph it! Happy Thursday! Yup, they definitely steal the show! I love this card. I love this image and the papers used. Well done.